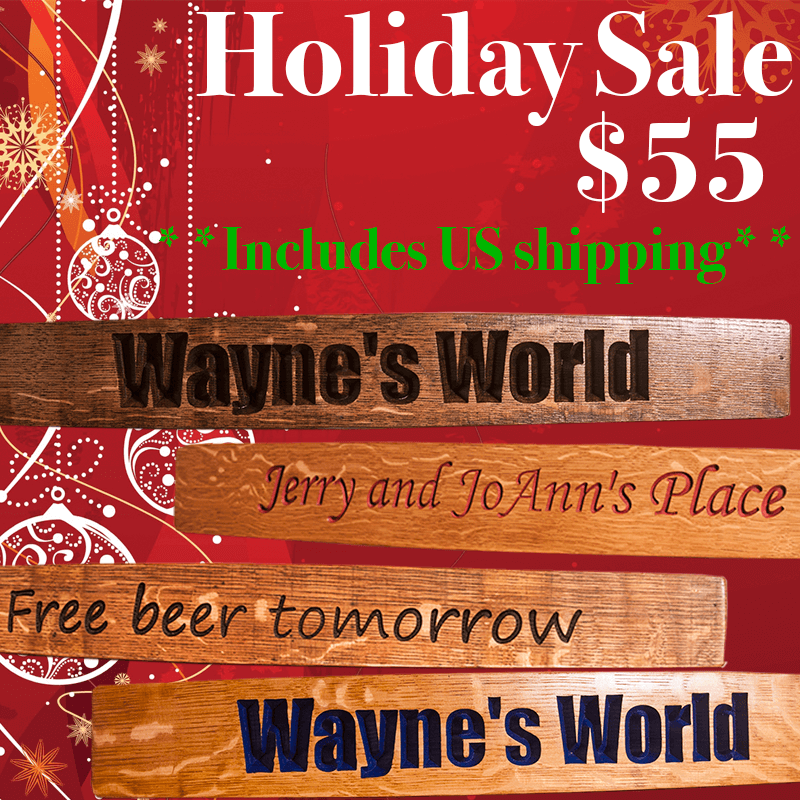 Looking for a very unique, beautiful, personalized wine décor gift for a very special wine, spirits or beer lover ? …something they will enjoy every day and treasure for a lifetime ? We offer unique personalized wine décor gifts for wine lovers, spirits enthusiasts and beer lovers – personalized wine décor gifts that are sure to please. Looking for that perfect personalized wedding gift or a personalized anniversary gift to celebrate a milestone like 50 years together? We offer the perfect gift for couples they will cherish the rest of their lives. Click any photo to see a gallery with more ideas. Wine Barrel Lazy Susan Tray (now only $129). Stave Signs (were $75, now only $55 including US Shipping), Wine Barrel Compass Rose Tenth Barrel Clock (was $330, now $250), Whiskey Barrel Sign (was $169, now $139). Click on images for ordering info. This person will almost surely have a special focal point in their bar, tasting room or cellar for display of a unique work of barrel art, ideally of great personal significance to them, which will serve as both a center piece and a conversation piece. There is no better choice than one of our barrel carvings, personalized with carved text of their family name integrated with other symbols of their passions – ranging from wines to grapes to whiskey, to beers to sports to horses… you name it. Or make the barrel head more practical by making it into a clock, or a table top for one of our beautiful tasting tables. For a lower budget, consider a personalized lazy susan or stave sign. Any of these make fantastic house warming gifts from friends and family, builders and realtors. Click the photos below for more ideas. There’s no more perfect gift for the couple (or your fiance, spouse, parents or children) who share your love of wine, whiskey or beer, than than a barrel carving to commemorate their wedding or anniversary. Our personalized wedding and anniversary themed barrel carvings and clocks incorporate a range of design elements including wedding rings, monograms, names, initials and other highly personalized images and text. Click the photos below for more ideas. Many wine lovers are absolutely passionate about their favorite wine or winery. A perfect gift for them may be a barrel carving with a beautifully carved and painted logo or label of their favorite wine or winery, possibly integrated with their own personalized text or other imagery. The same applies for people passionate about a particular spirits or beer brand. Click the photos below for more ideas. Many people are fascinated by their family ancestry and genealogy, and want to display a symbol of their heritage in the form of an heirloom-quality work of art. A very traditional barrel carving of a family coat of arms and/or family crest is a perfect way to do this. You might also consider a more whimsical approach where we work with you to identify symbols and icons of the giftee’s passions in life to create a completely personalized, one of a kind coat of arms. Click the photos below for more ideas. For ranchers and others who love ranch & western living, few icons are as personal and meaningful as a ranch brand. You can incorporate that brand, along with other symbols and icons of the western lifestyle (horses, boots, spurs, hats, ropes) into a unique composition that we can carve on a barrel head, turn into a barrel clock or tasting table. Click the photos below for more ideas. An owner of a boat or a home on the water may love something with a highly personalized nautical or marine theme. Design a barrel carving or clock by incorporating a variety of symbols from the sea including boats, ships, ship wheels, anchors, shells or a wide selection of fish and marine mammals. Click the photos below for more ideas. Here’s a really cool idea for the wine, spirits or beer lover who also loves playing cards or has a game room in their home. These barrel clocks include an elaborately detailed carving and painting of any playing card of your choice, along with personalized text. Click the photo for more ideas. 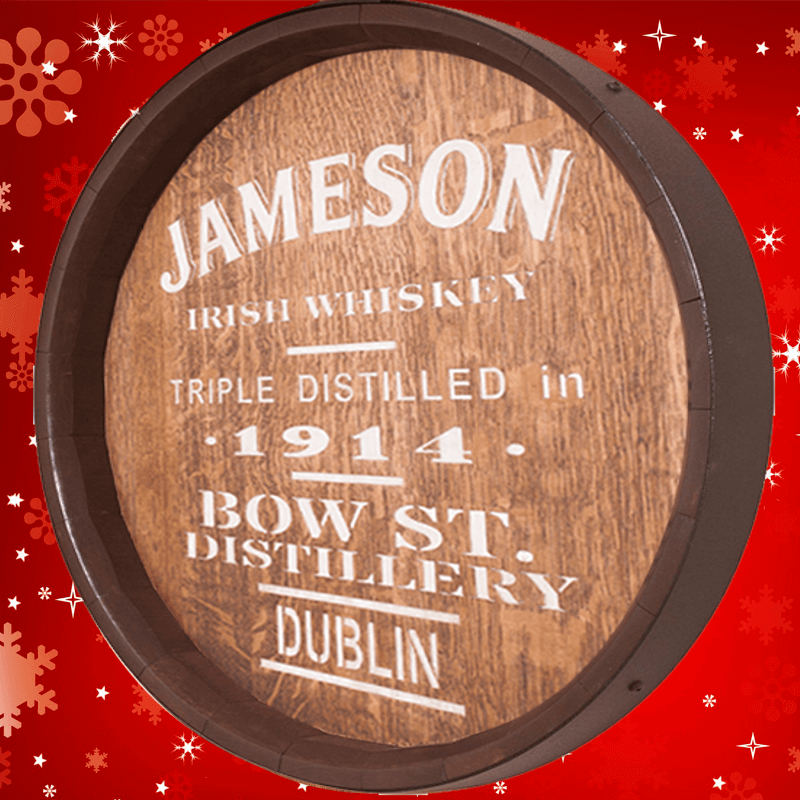 Many of our customers have pooled their resources for a gift to a friend or family member who has just opened, or is celebrating the anniversary or expansion of, a bar, club, restaurant, wine store, etc. 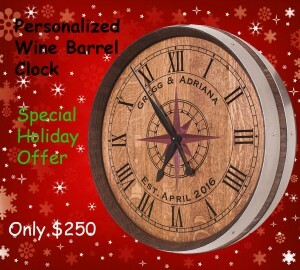 A barrel carving or clock with the name and/or logo, and some personalized text makes a fantastic gift for them. Click the photos for more ideas. 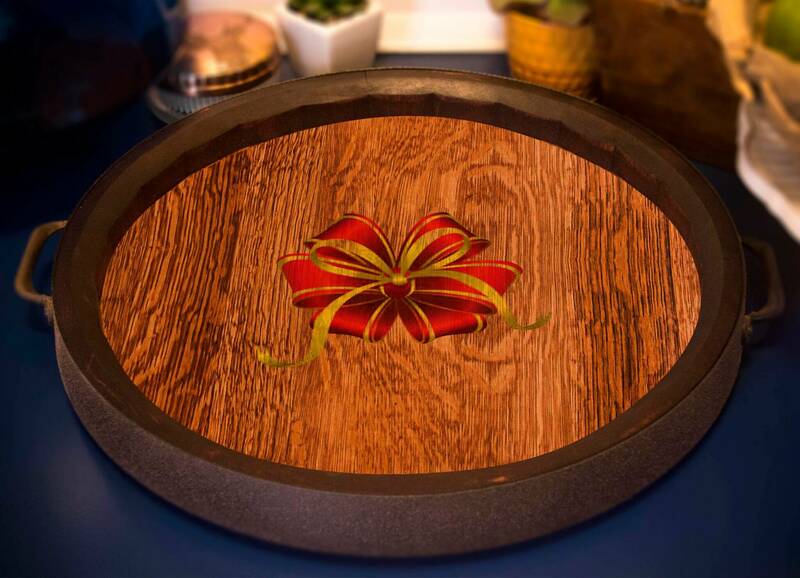 A barrel carving, clock or lazy susan can be the perfect gift for a valued employee who is retiring or deserving of a special prize or honor. The corporate logo can be incorporated in either a subtle or prominent manner, along with a highly personalized message. Click the photos for more ideas.